Each month, thousands of infertile couples undergoing in vitro fertilization (IVF) must make the same agonizing, emotionally exhausting decision: to give up or continue with an expensive and physically difficult procedure, even after previous IVF cycles have failed. Researchers at Stanford University report that they may be able to make that decision easier. 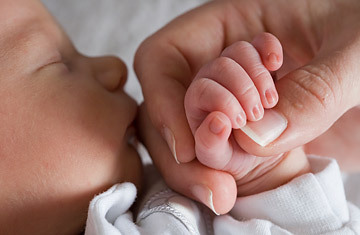 After analyzing the dozens of factors that fertility specialists consider when helping couples conceive, the Stanford researchers whittled down the list to the four most powerful predictors of an IVF pregnancy: the total number of embryos that a couple produces during a cycle, the number of embryos that survive to the eight-cell stage, the percentage of embryos that stop dividing and a woman's level of the follicle-stimulating hormone. What surprised the study's authors was that these measures appeared to be more relevant to establishing a pregnancy than embryo quality  that is, how many of a couple's "good" embryos are transplanted to the womb. That may explain why IVF success rates are so variable; why, though two couples may produce an equal number of healthy embryos, one becomes pregnant while the other doesn't. "Using only these four factors, we can predict pregnancy with an accuracy of 70%," says Dr. Mylene Yao, professor of obstetrics and gynecology at Stanford and lead author of the study. "And it's extremely interesting that the four factors do not actually relate to the embryos that are transferred to the womb. So while it's still important to identify the best embryos for transfer, this suggests that we shouldn't neglect all the other embryos and the information that we can extract from them." Yao notes that doctors in IVF clinics necessarily focus their attention on good embryos, selecting those that appear to be growing more vigorously than others, then choosing the most robust from that collection for implantation. But her study hints that taking into account the quality of the entire batch of embryos a couple produces might give doctors and their patients a better idea of their chances with IVF. Indirectly, says Yao, the four factors reflect all the other elements that play a role in a couple's fertility, including a woman's age and her medical history. While fertility specialists have long known about these factors and their role in predicting IVF success, Yao and her team have set out to determine which ones matter most  and how each factor affects the others in individual cases. For instance, doctors know that older women in general have a more difficult time conceiving. But Yao believes it should be possible to better predict whether a woman in her 40s will get pregnant through IVF based on the overall quality of the embryos she and her partner produce. Doctors already use their own algorithms for determining a couple's chances of having a baby, but Yao and her team are attempting to streamline and standardize the process. Ultimately, she believes, the embryo screen will be able to help couples who have already undergone one unsuccessful cycle of IVF to decide whether or not to invest in additional attempts. Before that can happen, however, Dr. Zev Rosenwaks, director of the Center for Reproductive Medicine at Weill Cornell Medical College, notes that more data needs to be collected on the power of these factors to predict not just a pregnancy, but a viable pregnancy. "This is a very interesting study, but I don't think it changes our ability to predict pregnancy," he says. Yao's team is already planning to expand their study to analyze how well these four variables will be able to predict live births. If the factors prove predictive, they could provide infertile couples with some much-needed guidance in making a very difficult decision.